The temperature outside are getting unbearable. Watching this bear frolic in a family's backyard is likely to bring back fond moments from your childhood. Bears are many people’s favorite animal, and it’s easy to see why. Despite their massive size, sharp claws and teeth, and history of dangerous encounters with humans, they’re really just big ol’ softies on the inside. 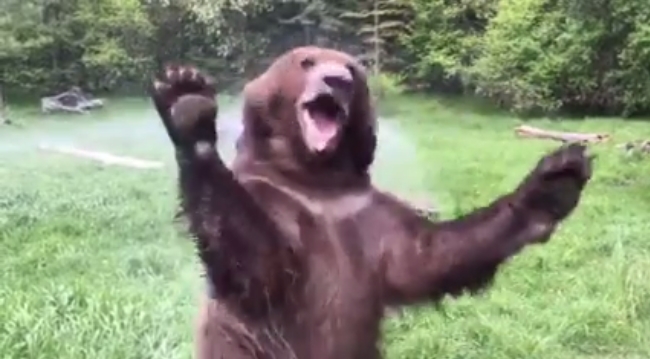 And if you need proof, just watch what happens when this bear at the Triple D Ranch in Kalispell, Montana does when he sees that the sprinklers are on. You’ll never look at these amazing animals the same way again! Grizzly bears once roamed over most of North America west of the Mississippi. Within the last century grizzlies were reduced to a few remnant populations scattered through the Northern Rockies and Cascades. Two of the six remaining areas are in northwest Montana. The largest area straddles the continental divide from Canada south to near Missoula. Another area is near Libby in the Cabinet/Yaak. Scientists estimate 500-600 grizzlies currently live in northwest Montana. In 1975 grizzlies were listed as "threatened" under the Endangered Species Act. Responses to "Bear Has The Best Day Ever, Thanks To Kind Human"
even bears want comfort too & this one found a great way to cool off & play a little! Best part, no one (including the bear) was hurt...very kind people!